Toronto is heating up! This year I vow to be prepared for any heat wave this city wants to throw at me! 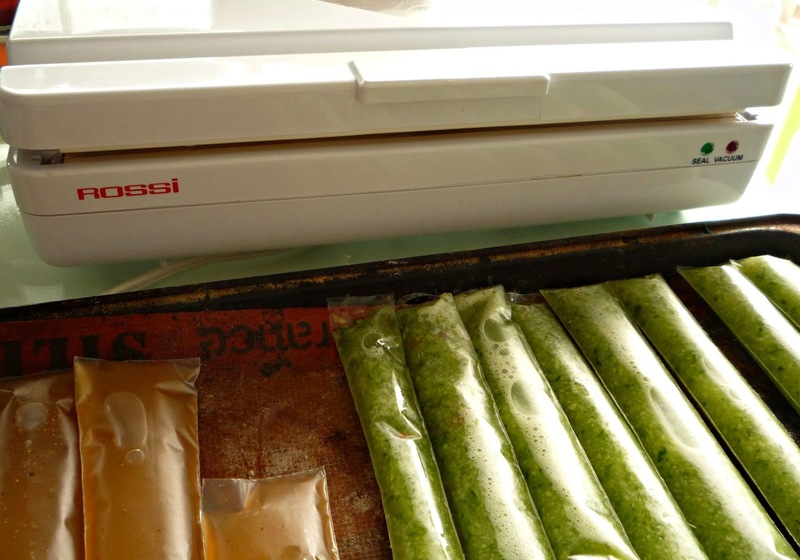 This afternoon, while listening to Alphabet Soup Podcast I stocked my freezer with two batches of homemade freezies. I picked up this food saver/sealer from a thrift store for four dollars. A few days later I found three full rolls of the plastic at a different thrift store. 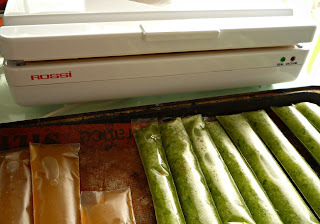 The vacuum part of the sealer does not work but it seals the plastic thus making it possible to make homemade freezies in the traditional plastic sleeve. 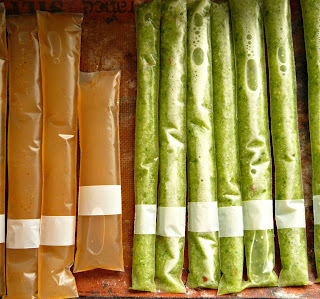 I made two recipes from 200 Best Ice Pop Recipes . The freezie on the left is "Spicy Lime Ice Pop" and the one on the right is "Cucumber Chile Ice Pop". I recently had a Cucumber Chile popsicle from a local company - Augie's Gourmet Ice Pops - and it was divine! I am very much looking forward to the version from this book. The Small Print: I received this cookbook as a review product. I did not promise a positive review nor receive any additional compensation for this review. The link to the 200 Best Ice Pop Recipes does not work. Do you have a hardcopy of this?